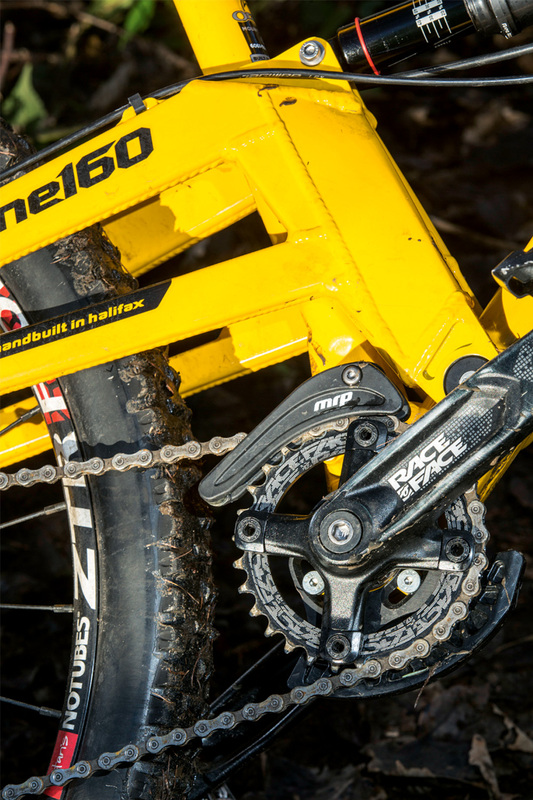 With larger, 650b wheels, the new Orange Alpine 160 has been given a sizing reboot. For 2015, to match the move to bigger 650b wheels, the new Orange Alpine 160 has been given a sizing reboot. It’s now 20mm longer in the front centre, easily making it the rangiest bike here. To keep the cockpit length manageable and retain responsive steering, Orange fits a stubby 35mm length stem across all four frame sizes. A relaxed 65° head angle and upright seat tube match the straight up/straight down attitude of the bike, while the standard bottom bracket shell (with ISCG tabs for fitting a full-blown chain device) sits only 7mm below the wheel axles, giving it the most ground clearance on test. Despite these geometry and sizing revisions, the frame and suspension layout remain largely unchanged. Durability in UK conditions has always been a big selling point for Orange, hence the Alpine retains the tried-and-trusted single-pivot suspension and burly, folded monocoque mainframe. There are gussets around the head tube, seat tube and rear stays to stiffen the frame, and user-friendly, fully external cable routing to make maintenance a doddle. While we love the simplicity of the elevated swingarm, there’s nothing in the way of frame protection, so the chain makes one hell of a racket where it slaps against the underside of the stay. It’s off-putting and does nothing for the paintwork. The 160mm-travel Pike RCT3 Solo Air needs no introduction; it’s one of our favourite forks. Unfortunately, the performance between the front and rear suspension doesn’t quite add up. The Monarch Plus shock didn’t have any volume reducers in the air sleeve, so to keep it supportive throughout the stroke we needed to run higher pressures — all the way down to 15 per cent sag to begin with. The problem is, that meant a harsher ride, less rear- wheel grip and a perched riding position. Adding six volume reducers (red bands) and reducing the air pressure did improve spring progression and grip, but it was still possible to bottom the bike harshly with as little as 25 per cent sag. The high cost of UK frame manufacturing means Orange struggles to compete on value. Instead it has sensibly chosen tough and reliable kit such as Shimano XT brakes, Hope Pro Evo II hubs (now with faster engagement) and a mix of gravity-oriented Race Face and Kore parts. 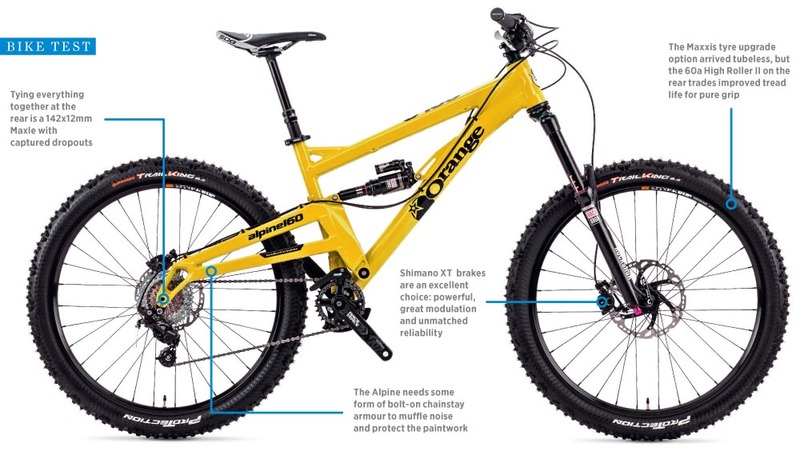 This matches the Alpine’s DH intentions, but does mean the Orange is 3lb heavier than the others on test. There’s no SRAM 1×11 drivetrain here. 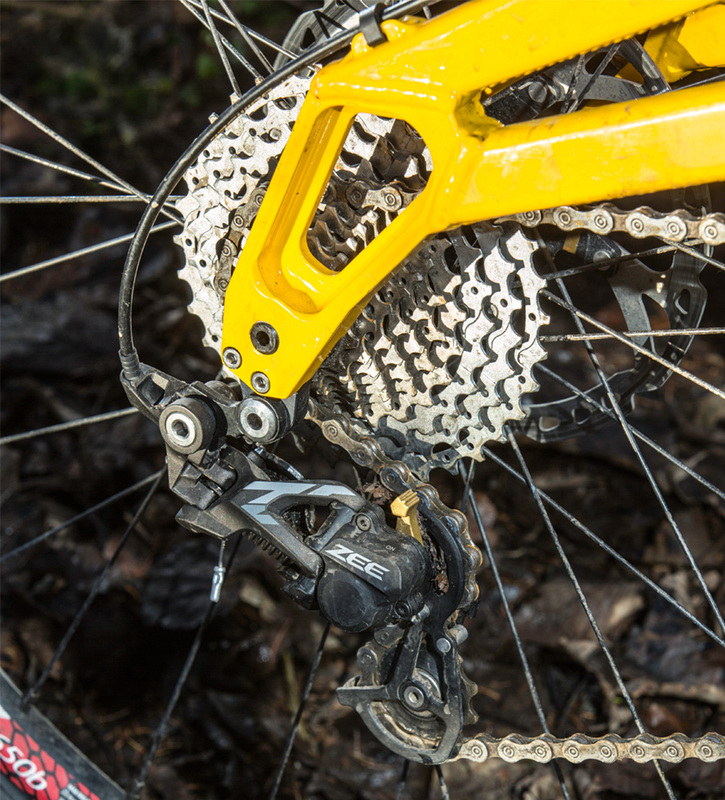 Instead, Orange fits a standard 10-speed 11-36t cassette with a 30t narrow/wide chainring. It all works fine and if the gearing proves too tall for you there’s a front mech mount behind the MRP chain device. There’s a darker side to the gear ratios on the Orange however, namely chain growth. With the small 30t chainring the chain line is well below the main pivot and this impedes the action of the rear suspension. The roomy Alpine pedals efficiently and has plenty of grip when climbing, so chugging up to the fun bits is a relatively painless affair, in spite of the 32lb weight. That said, we reckon less fit riders may struggle to live with the Orange’s bulk if it’s their only bike. On the plus side the Alpine enjoys slinking down super-steep, slippery, natural trails, where the lengthy wheelbase and slack angles provide a good foil to ninja roots and endless ruts. It’s a choppy ride under hard braking, but the inherent stability keeps the bike manageable at all times. 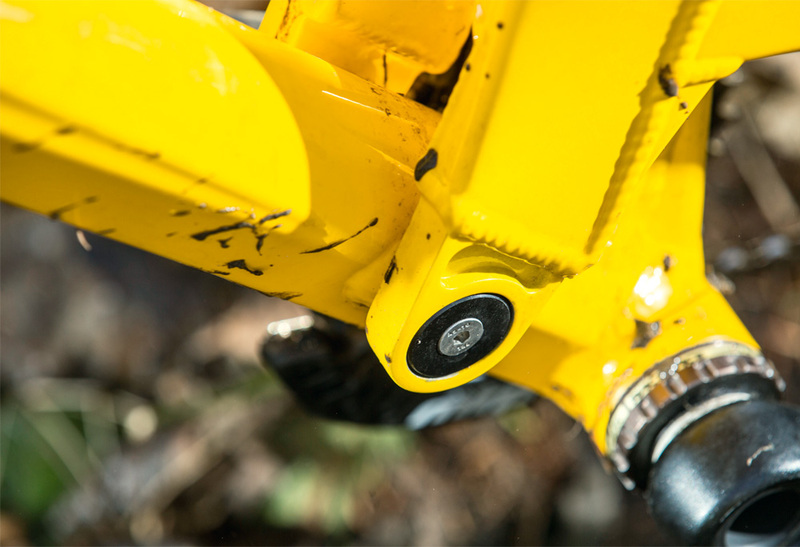 The slightly higher bottom bracket also gives plenty of clearance over rocky and rooty obstacles. Being a big, slack bike the Alpine rides stable enough to bomb down rough terrain, but there’s a distinct lack of zip and acceleration. The suspension is soft and muted, yet not particularly sensitive or planted on successive hits. It doesn’t help that the frame isn’t the stiffest laterally either, so it’s more difficult to ride dynamically or inject sudden direction changes. Then again, this could just be down to the lacklustre shock tune. Even though enduro racing is in the Alpine’s remit, the RS model is too heavy to be competitive. With a long wheelbase and slack angles, the bike should be a stable, straight-line bomber, ploughing confidently down slippery, rocky terrain like a mini DH bike, but the suspension isn’t really convincing here either. With the stock Monarch Plus RC3 shock, the bike is subdued, lacks support, and isn’t that manoeuvrable when swapping from berm to berm or launching off jumps. 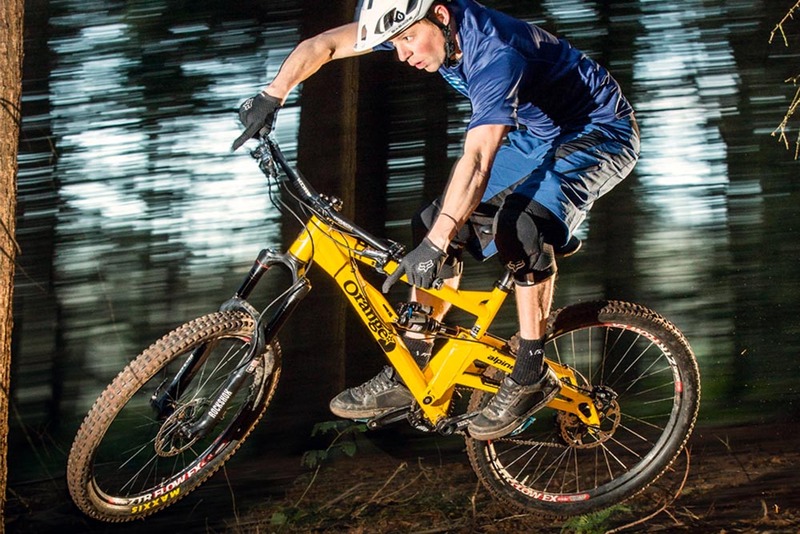 Yes, the Alpine 160 RS has proven UK reliablility, and is built tough, but that’s simply not enough for a modern all-mountain bike costing nearly £4,000.